U.S. Navy Signalman Joe Meadors was standing watch on deck of the USS Liberty off the coast of Gaza on June 8, 1967 when a 90-minute aerial and sea attack by Israel against the ship killed 34 U.S. sailors and wounded 174. Meadors watched as the Israeli military almost sank the Liberty and began machine-gunning the lifeboats. A 2003 U.S. commission led by Admiral Thomas Moorer found Israel guilty of the attack. But the motive is still shrouded in mystery. 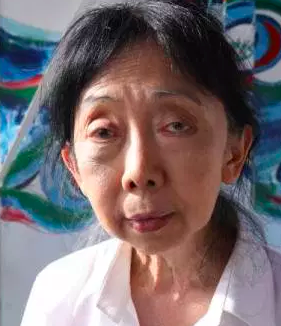 Fifty-one years later, on July 29, Meadors was again on board a ship in international waters, again off the coast of Gaza. And once again Israel brutally attacked his ve. But this time Israel’s motive was clear. Meadors was aboard an unarmed civilian boat named Al Awda that was trying to break Israel’s seven-year-old illegal blockade of Gaza. Four crew members and delegates were tasered by Israeli forces. One crew member was repeatedly tasered on the head and neck and another also received multiple taser shocks, said Shapira. Both were in serious medical condition and were semi-conscious during the seven-hour trip to Givon prison in Ashdod, Israel. An IDF Spokesperson said: “The overtaking of the Al-Awda ship was carried out without violence and without exceptional events.” Mondoweiss reported that the IDF Attorney unit said there’s no need for an investigation of what happened onboard the Al Awda. Meadors was held in Israeli detention until he was deported back to the U.S. on July 31, arriving in Corpus Christi, Texas on Aug. 4. Activists from Dallas and Houston traveled to Corpus Christi to greet him the following day. No newspaper or TV station in Corpus Christi or Houston called Meadors despite being sent copious materials and updates. 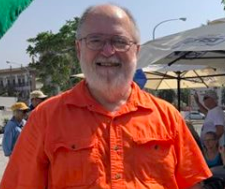 Meadors survived the Israeli attack on his U.S. Navy ship, has been outspoken about the incident for years causing embarrassment to Israel, and was now under arrest in an Israeli jail. His alleged crime was being aboard a boat trying to break an illegal blockade in international waters and bring medical supplies to Gazans. Meadors says he was not mistreated while in detention. He said neither he nor the Israeli authorities brought up the USS Liberty during his questioning. Other passengers on the Al Awda were not so well treated. “After a while the boat engine started. I was told later by Gerd who was able to hear Captain Herman tell the story to the Norwegian Consul in prison that the Israelis wanted Herman to start the engine, and threatened to kill him if he would not do so. But what they did not understand was that with this boat, once the engine stopped it can only be restarted manually in the engine room in the cabin level below. Arne the engineer refused to restart the engine, so the Israelis brought Herman down and hit him in front of Arne making it clear that they will continue to hit Herman if Arne would not start the engine. Arne is 70 years old, and when he saw Herman’s face went ash color, he gave in and started the engine manually. Gerd broke into tears when she was narrating this part of the story. The Israelis then took charge of the boat and drove it to Ashdod. 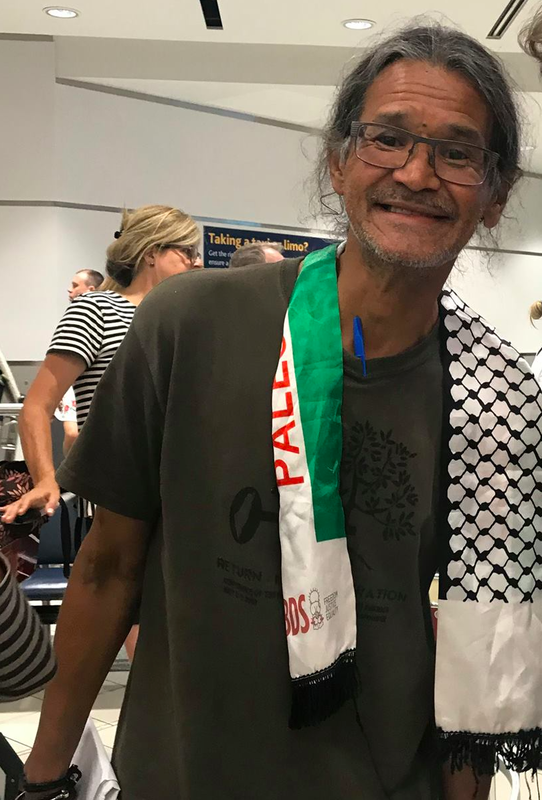 An Indigenous leader from Canada, Larry Commodore, was thrown to the deck and injured his foot when he requested to have his passport back as the passengers were being taken from the boat. He told The Real News Network that a few hours after his return to Givon prison, he developed bladder problems resulting from his injuries and had to be re-hospitalized as he could not pass urine. Prison guards did not believe he was injured and forced him to drink more water which resulted in a worsened bladder. Commodore had to wait 10 hours for a doctor to come to the prison for him to be taken to the hospital for a catheter. When he was deported to Canada, he was taken to a Toronto hospital where he received further treatment. His injured foot was also sewn up. He said he passed out several times during the procedure. Several delegates were not given their prescribed daily medicines. Israeli Prime Minister Netanyahu describes the Israeli military as the most “moral” military in the world. Crew and delegates on Al Awda found that the Israeli commandos and military administrative staff and prison staff did not act morally. Six delegates said that cash, credit cards, clothing and personal items were taken from them and never returned. An estimated $4000 in cash and numerous credit cards were stolen. Delegates are cancelling their credit cards upon their return home and will be monitoring whether there are charges from July 29 onward, as happened in 2010 when Israeli soldiers reportedly used credit cards of passengers from the six ships of the 2010 Gaza Freedom Flotilla. Israeli commandos stopped Freedom, the second ship in the 2018 Gaza Freedom Flotilla, 40 miles off Gaza on Aug. 3. Twelve delegates and crew from five countries have been taken to Givon prison. It’s not clear whether the Freedomdelegates were also abused. The Gaza Freedom Flotilla Coalition continues to demand that the State of Israel send to the Gazan people the €13,000 worth of medical supplies, primarily gauze and sutures, in 116 boxes onboard Al Awda and Freedom. Twelve national campaigns organized the 2018 Gaza Freedom Flotilla to not only bring much needed aid, but also attention to the illegal Israeli blockade and repeated, attacks on Gaza. “In the week we were sailing to Gaza, they had shot dead 7 Palestinians and wounded more than 90 with live bullets in Gaza. They had further shut down fuel and food to Gaza. Two million Palestinians in Gaza live without clean water, with only 2-4 hours of electricity, in homes destroyed by Israeli bombs, in a prison blockaded by land, air and sea for 12 years. The hospitals of Gaza since the 30 March had treated more than 9,071 wounded persons, 4,348 shot by machine guns from a hundred Israeli snipers while they were mounting peaceful demonstrations inside the borders of Gaza on their own land. Most of the gun-shot wounds were to the lower limbs and with depleted treatment facilities the limbs will suffer amputation. In this period more than 165 Palestinians had been shot dead by the same snipers, including medics and journalists, children and women. 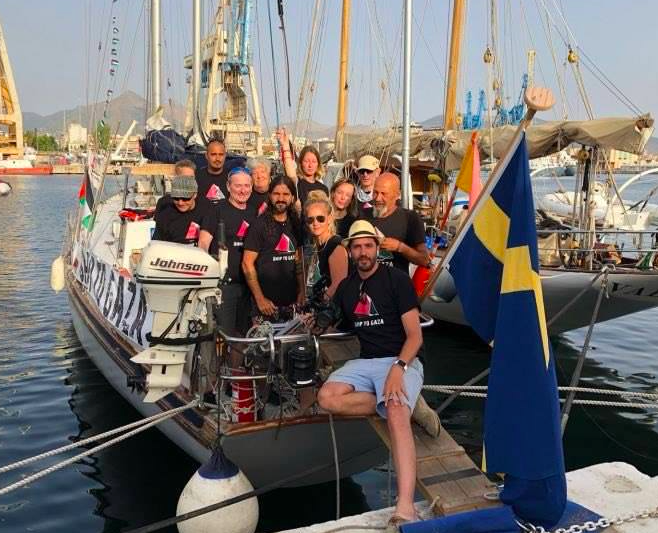 The Al Awda was part of a four-boat 2018 Gaza Freedom Flotilla that began its voyage in mid-May from Scandinavia and arrived 75 day later off the coast of Gaza. Al Awda arrived on July 29 followed by Freedom on August 3. The two other boats of the flotilla, the Filestine and Mairead Maguire, were unable to complete the voyage due to damages incurred during a storm off Sicily and maintenance problems. CORRECTION: An earlier version of this story said Meadors was held for six days by Israel. He was arrested on July 29 and deported on July 31 to Miami and returned home to Texas on Aug. 4. He was held for three days.